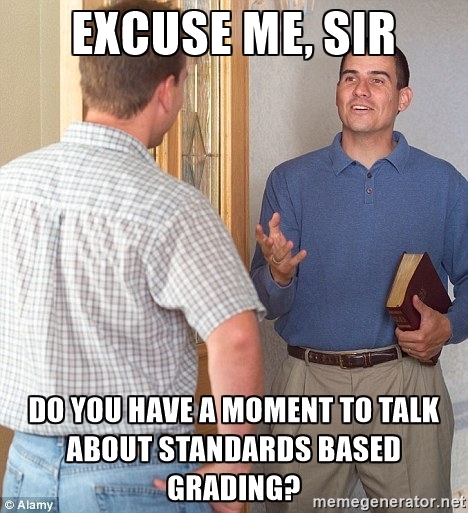 As I've stated previously, I'm diving into Standards-Based Grading this year. Several other teachers in my building have expressed interest in it as well and have asked me to talk to them about my process. We have a new superintendent. 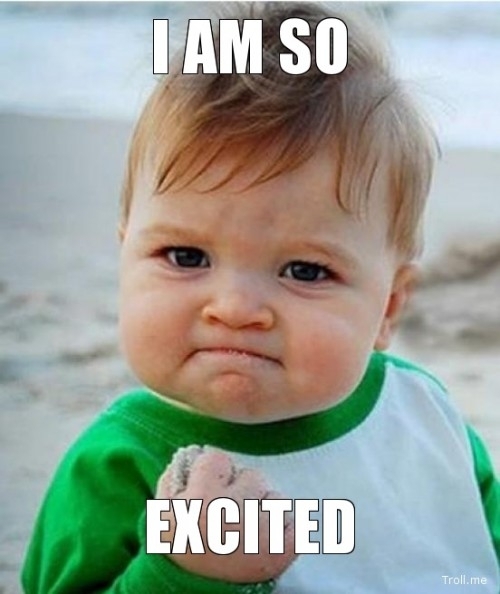 In the next two months, we will have a new elementary principal and next year, will have a new high school principal. To me, this appears to be an ideal situation to make some monumental changes. I spoke with a few of the other teachers and they agreed. I went to put the bug in my superintendents ear and she was very amenable to the idea and has asked me to speak to the faculty at our meeting next week. I'm VERY excited. 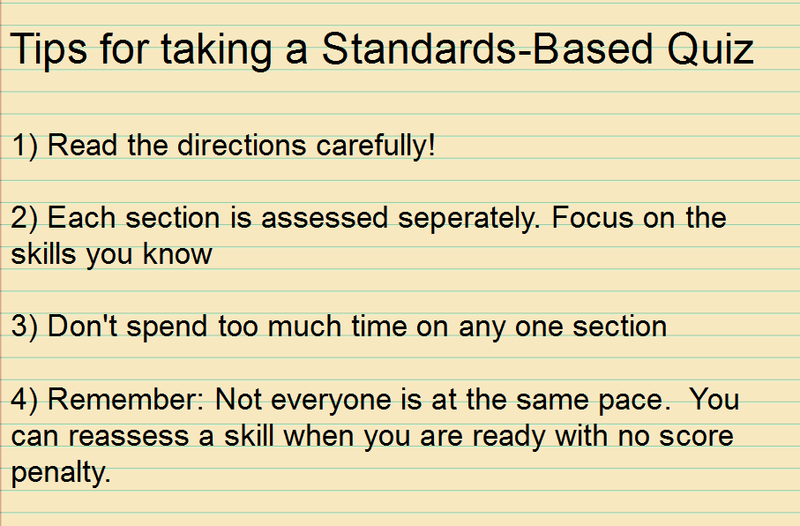 Since this was the first time that my students had experienced an SBG-style quiz, I put up a few tips for them. I read over these and emphasized that none of the grades were permanent, as long as they were willing to reassess those skills. I had lots of pushback from one of my classes, who flew into a panic about not knowing what was on the quiz, that we were even having a quiz, or that the quiz would be graded. I tried to have patience with them since many in this group are the "accelerated" students and have grade pressure on them. The harm that we do to our students by making them think they not only have to get everything perfect, but do so the first time, is staggering. I know this process will take a while, but I believe in it and the research backs it up. With administrative support and other teachers getting involved, I believe it will be alright. I am a HUGE nerd for spreadsheets! I'm not great with making them look all fancy schmancy, but I love adding functionality and color-coding! 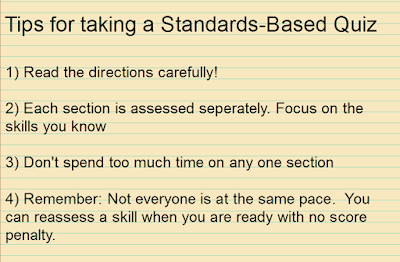 Standards-based grading provides such and incredible wealth of information and an excellent opportunity to play around with spreadsheets! So I made one! SBG. So what does all of this stuff mean? I have taken all of the standards and put them into simple "I can" statements, such as "I can describe situations where opposite quantities combine to make 0. (Standard 7.NS.A.1A)" and given them specific numbers. That standard is Skill 2. Each section on the quiz covered a specific standard and students received a score for each. This quiz covered 6 standards, so it had 6 sections and students earned 6 scores, as listed above. 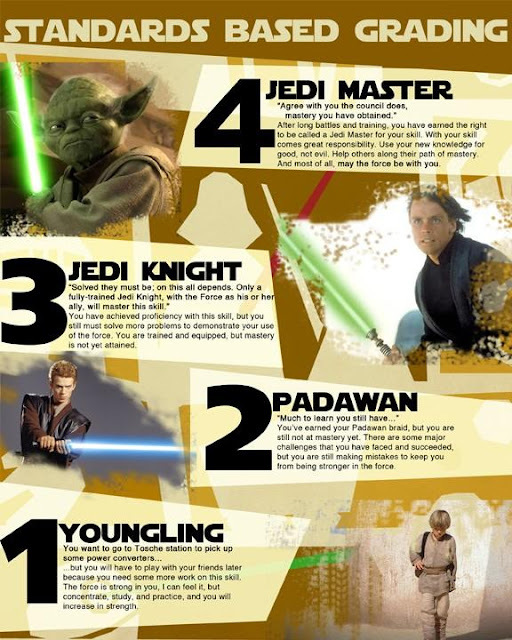 There are a ton of ways to describe what each number means and I use a Star Wars-based poster, which is fantastic! I used conditional formatting to set up color gradients. 3 and 4 are green, indicating that the student is good to move on. 0, 1 and 2 show some (or lots) of work to do. Above the skill, I have the sheet add the number of students who have earned each score. This allows me a quick glance to see which skills need to be readdressed as a group, instead of individually. 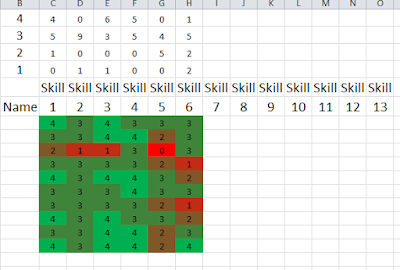 For example, the above graph shows me that my students are doing pretty well on Skills 1-4, but that we could still do some work together on Skills 5 and 6. With individual students, I'm able to look across the row and see what their strengths are and on which skills I should work with them. One of my favorite aspects of this sheet is the ability to sort. When we are looking at what topics to cover next, I can sort the list by skill score and group together students accordingly, either struggling students together so I can work more closely with them, or heterogeneously so they can help each other. In terms of Skill 6, I may have the students with 3's and 4's teach the others in pairs, or I may put all of the 2's and 1's together, work with them myself while giving the rest a different task. I like data, but most of the student data that we collect is not done in a way that makes it easy to address. This timely and brilliantly color-coded feedback will allow me to create more data-driven instruction. Now, to spread the good word! I was a bit distressed, however, at the number of students later in the day who looked at the test and immediately gave up. Several students were crying about how difficult it was and how they were failures and going to fail. There is a TON of work for me to do in terms of mindset.